Study successfully targets nerve endings to curb allergic asthma in animal model. Current asthma medications, which work by suppressing inflammatory signaling by immune cells or by dilating the airways, can stop working over time. Now, a new study from Boston Children’s Hospital, Brigham and Women’s Hospital, and Harvard Medical School supports a highly innovative approach to controlling asthma; by targeting certain sensory nerve endings in the lungs that help drive allergic inflammation. The opensource study is published in the journal Neuron. Previous studies show that nociceptors in the lungs connect to the brainstem and trigger the cough reflex when they detect potential harms like dust particles, chemical irritants or allergens. Nociceptor nerve endings are known to be more plentiful and more readily activated in people with asthma, but a role in driving allergic inflammation had not previously been suspected. The team state that an attractive aspect of targeting nociceptors is that this approach would be most effective when inflammation is already present and should accelerate its resolution. The current study shows that nociceptors are not only activated by allergic inflammation, but also exacerbate the allergic immune response. When these neurons were selectively silenced in mouse models of acute and chronic asthma, both inflammation and bronchial twitchiness were reduced. The researchers explain that current asthma treatments can help to control symptoms and dampen airway inflammation; however, therapies are not available to promote the resolution of asthma. A treatment to interrupt the vicious cycle of neuro-immune signaling holds promise as a disease-modifying therapy and is mechanistically distinct from any of the currently available asthma therapies. The researchers tested a strategy for selectively blocking nociceptor activity in mice using a drug called QX-314. The team explain that QX-314 is chemically related to the local anesthetic lidocaine, modified in such a way that it specifically targets inflammation-activated nociceptors (including those in the lung) and stays inside cells for prolonged periods without getting into the bloodstream. The researchers believe these properties will increase the drug’s duration of action in the lung and limit side effects. They go on to note that QX-314 is not able to get into nerve cells normally, however it can enter cells by passing through the large pores of TRP-family ion channels, which are expressed selectively in nociceptors and are activated during inflammation. This limits the action of QX-314 to just the neurons activated by inflammation. The researchers stress that people have tried to use lidocaine itself to target asthma, however, it works nonspecifically on all neurons, posing a risk of impaired swallowing. It can also spread to and act on the heart and brain. In the current study the lab induced asthma in mice by exposing them to dust mites or another allergen, ovalbumin, then administered QX-314 via nebulizer to silence the nociceptors. The data findings show that when stimulated, nociceptors release chemicals (neuropeptides) that cause immune cells to infiltrate the lungs and become more active. 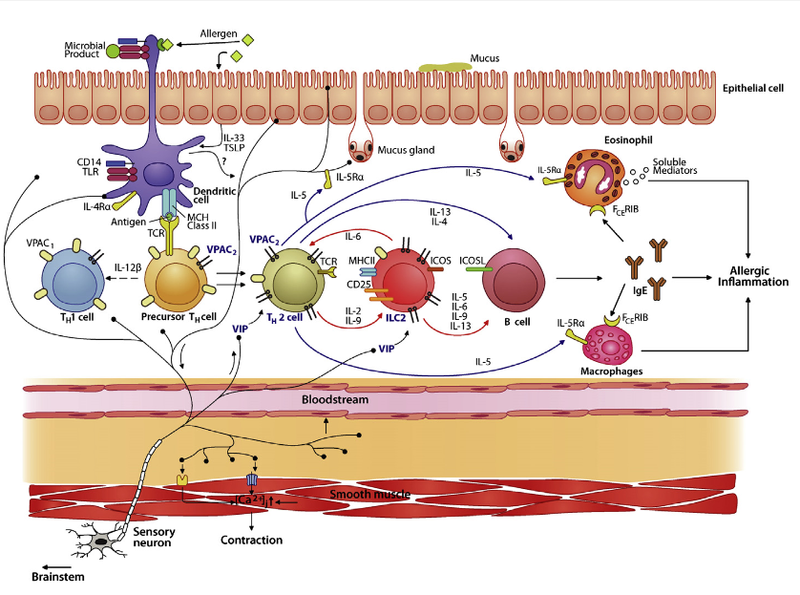 IL-5, an inflammatory molecule produced by the immune cells, in turn activates the nociceptors to produce a neuropeptide called vasoactive intestinal peptide (VIP). VIP further stimulates the inflammatory response, creating a neuro-immune feedback loop that inflames the lungs and escalates asthma symptoms. When asthmatic mice had their nociceptors silenced, either genetically or with QX-314, they had much less airway inflammation and less bronchial twitchiness. The researchers conclude that nociceptors both react to and drive inflammatory immune responses in the lung, and that silencing these cells interrupts this feedback loop, helping relieve allergic airway inflammation and bronchospasm. The team are now working on new, more potent versions of QX-314 that would enhance its safety but preserve and even increase its beneficial properties. They go on to add that they are sufficiently encouraged by the strong relief of lung inflammation and airway constriction to actively embark on a major drug development program, with the aim of clinically testing this strategy for multiple allergic conditions. Licona-Limo ́n et al. (2013) and Vercelli (2008). Silencing Nociceptor Neurons Reduces Allergic Airway Inflammation. Woolf et al 2015. This wgole problem is caused by a Thiicyanate Deficiency that essentially blocks signslling by neutrophols and B-cells.